From the time that chemistry student Charles Martin Hall discovered the process for producing aluminum, the metal has had a huge impact on Pittsburgh. From establishing the city as Alcoa’s–The Aluminum Company of America–world headquarters to creating thousands of jobs and producing numerous materials from aluminum, there may be no grander testament to aluminum’s impact on our city than the Alcoa Building itself. 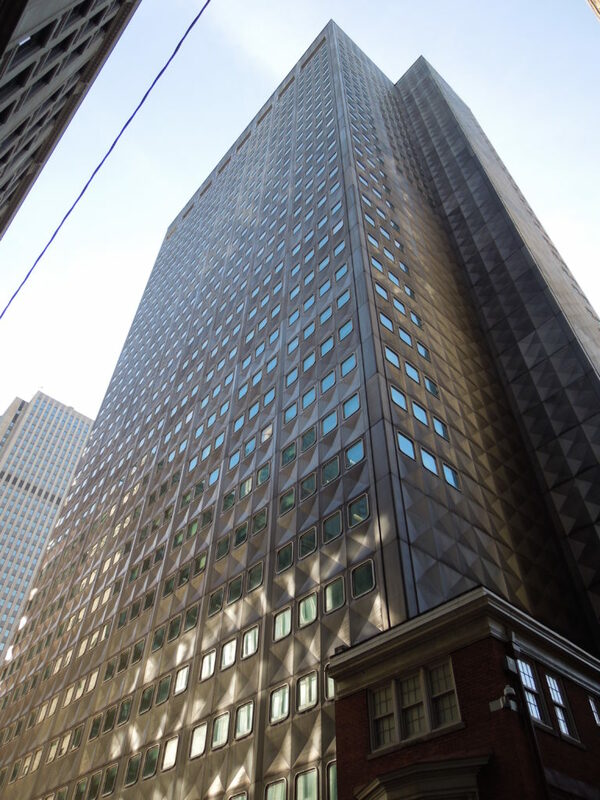 Now known as the Regional Enterprise Tower, the Alcoa Building on Sixth Avenue in downtown Pittsburgh was the first headquarters for the corporation. Construction on that first Alcoa Building began in 1951 and was completed in 1953. The skyscraper was innovative in that it used aluminum extensively in its construction. The 30-story tower’s façade is covered in stamped aluminum panels. Many other parts were also made of aluminum: the windows, sashes, and frames; heating and ventilating ducts; and water piping and wiring systems. It also has aluminum windows that rotate 360 degrees so that they can be washed from the inside of the building. Although the Alcoa Building is a beautiful asset to the Pittsburgh skyline, its construction was not welcomed by all. The building is situated on the site where the former Nixon Theater was located. There was great outcry when the Nixon property was sold to Alcoa with the prospect of razing the theater and constructing the new headquarters there. When Alcoa officials floated the idea of relocating their headquarters to New York City, the Mellon family stepped in and offered to build a new parking garage and plaza adjacent to the proposed Alcoa Building. The Mellon offer was accepted, and Alcoa stayed in Pittsburgh. Not only did Pittsburgh gain a revolutionary aluminum skyscraper, but it also gained the first modern garden plaza to be constructed on top of an underground parking garage. Some lauded the new building’s design, but some criticized it as looking like old television screens stack on top of each other. When Alcoa moved to the North Shore in 1998, that first building was renamed the Regional Enterprise Tower. It now houses government groups, regional nonprofits, and start-up companies. The building also houses luxury apartments called The Residences at the Historic Alcoa Building. 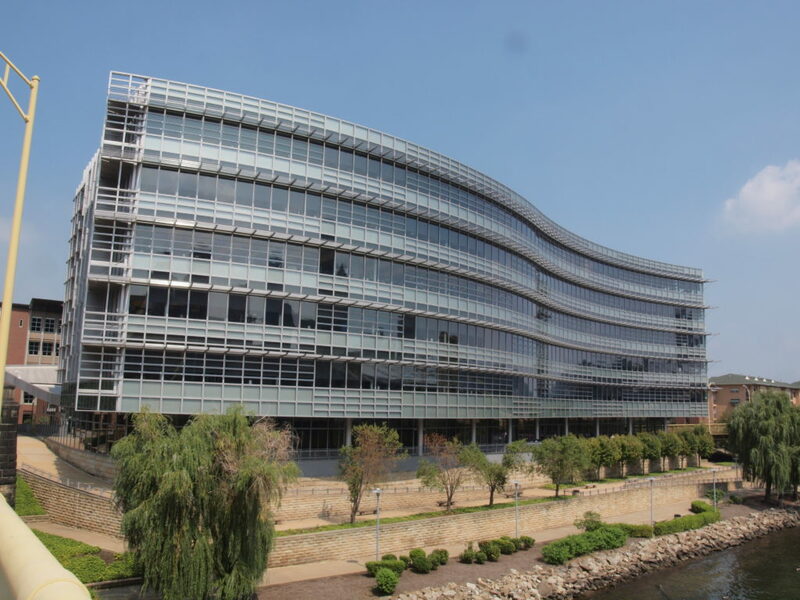 The new Alcoa Building followed the tradition of innovation, flowing along the North Shore of the Allegheny River with a wave-like profile. The six-story aluminum and glass building on Isabella Street also made substantial use of aluminum. It used 800,000 pounds of aluminum as well as 70,000 square feet of exterior glass. The building boasts an open atrium and a cafeteria with a sweeping view of the Allegheny River. The new building made waves for another reason: it actually looks like a wave. 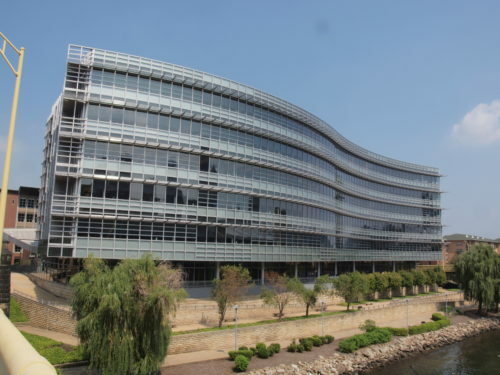 The building’s most distinguishing feature is its curvy, ripple-like design, which gives the sense that it’s flowing right along with the river. In 2016, Alcoa split into two independent companies: Alcoa, the smelting and refining operations; and Arconic, engineering products for the aerospace and automotive industries. In 2018, Arconic made plans to move its headquarters to Fairfax County, Virginia. However, that plan fell through in February 2019. With Alcoa and Arconic splitting, it’s not certain where the companies will eventually call home. In the fall of 2018, Alcoa expressed a desire to move its headquarters back into downtown Pittsburgh. Alcoa is still the chief aluminum producer in the country. Whether Alcoa and/or Arconic remain on the North Shore or not, Pittsburgh is blessed to have two architecturally distinct buildings.